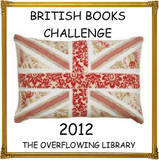 I joined the British Books Challenge at the beginning of this year, just as I have in 2010 and 2011. In both of those previous years I completed the challenge with ease. This year the BBC is being hosted at the Overflowing Library. In 2011 I discovered that over a third of what I read is British crime fiction. Certainly in 2012 that trend is continuing. I have now read 28 titles so far this year and 13 of them are British. This means that I have now already completed the "at least 12 books" level of the BBC. So I have decided that, for me, this is not really a challenge, although I will still keep my list to see if I get to the magical 50. I can see many British crime fiction titles waiting for me even now on Mt TBR. Sometimes you just discover that the reason a reading challenge appeals to you, is that it is just what you normally do. Completing the challenge is no struggle at all, but it is still enjoyable. In Australia’s 1930s, the Sinclair name is respectable and influential, yet the youngest son Rowland - an artist - has a talent for scandal. Even with the unemployed lining the streets, Rowland lives in a sheltered world... of wealth, culture & impeccable tailoring with the family fortune indulging his artistic passions & friends… a poet, a painter & a brazen sculptress. Mounting political tensions fuelled by the Great Depression take Australia to the brink of revolution. Rowland Sinclair is indifferent to the politics… until a brutal murder exposes an extraordinary & treasonous conspiracy. As the 21st century rolls on, and events that made us in the 19th and 20th get further away, Australians are in desperate need of good story tellers whose fictions are firmly embedded in an authentically drawn past. Last year Geoff McGeachin did it for me with THE DIGGERS REST HOTEL set in an Australia recovering from World War II, and now comes Sulari Gentill's series featuring artist and gentleman Rowland Sinclair, set in the period leading up to that war. A FEW RIGHT THINKING MEN is #1 in the series, and now there are two more for me to track down, A DECLINE IN PROPHETS, and MILES OFF COURSE. Gentill does a wonderful job of embedding her fictional protagonist Rowland Sinclair into authentic historical detail: Australia in the Great Depression; the Premier of New South Wales seeking to distract the people by building a great bridge across Sydney Harbour; and widely disparate political groups who want to roll time back to the 19th century, or to adopt Communism, or to install Fascism. Coming from a wealthy landed family Rowly Sinclair is caught in a cleft stick between the old values and his friends who have joined the Reds. And then his uncle Rowland Sinclair is murdered and Rowly's quest to find the culprits takes him into the third group. This was an excellent read: well constructed plot, vividly drawn characters, and reminders of the historical events that occupied Australia's "premier state" in the early 1930s. More comments on the Pantera Press site. When a young girl is found strangled in a field, it looks like a routine job for the staff of the East Anglian Forensic Laboratory. But then the senior biologist is found dead in his lab and murder comes closer to home. And Commander Adam Dalgliesh faces the most baffling inquiry of his career. Death of an Expert Witness led Newsweek to crown P. D. James "the new queen of crime." DEATH OF AN EXPERT WITNESS is the perfect illustration of what took P.D. James to the top of British crime fiction. Characters are clearly defined, plotting is convoluted but tight, motives are hidden, and red herrings abound. There are in fact two main plot strands: the dead girl in the "clunge pit", and the murder at the forensic lab. What binds them together is that Dalgliesh and his team are investigating both, and that while the forensic lab is doing the SIO at the first, their senior biologist is killed in his lab. This novel shares characteristics with many others in the series: Dalgliesh makes a relatively late appearance, and the perpetrator is almost the last one standing, and his/her identity comes as a surprise. Michael Jayston does an excellent job of the narration too. The second Agatha Christie Blog Carnival for 2012 is now posted. There are 19 contributions from 13 participants, including some posting for the first time. The Blog Carnival now has over 60 people signed up, some who have pledged themselves to reading titles in order of publication (as I do) and others reading books as they come to hand. What makes the monthly carnival so interesting for me is seeing participant's reactions to various titles, and it certainly seems that people are still interested in reading them. It is never too late to sign up for the Agatha Christie Reading Challenge and to participate in the Blog Carnival. At a book a month I still have about 4 years of reading left. Check what I've managed so far. English crime novelist Charles Latimer is travelling in Istanbul when he makes the acquaintance of Turkish police inspector Colonel Haki. It is from him that he first hears of the mysterious Dimitrios - an infamous master criminal, long wanted by the law, whose body has just been fished out of the Bosphorus. Fascinated by the story, Latimer decides to retrace Dimitrios' steps across Europe to gather material for a new book. But, as he gradually discovers more about his subject's shadowy history, fascination tips over into obsession. And, in entering Dimitrios' criminal underworld, Latimer realizes that his own life may be on the line. I have been aware that, though I have well over four decades of dedicated crime fiction reading behind me, there are a number of "classics" that I have never touched. 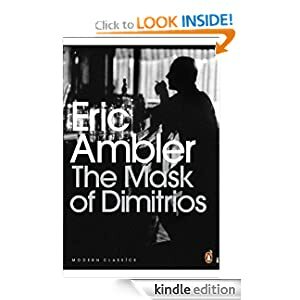 Eric Ambler's THE MASK OF DIMITRIOS, aka A COFFIN FOR DIMITRIOS, aka THE DOSSIER OF DIMITRIOS, is one of those. The Mask of Dimitrios is the work of a writer at the height of his powers. Saturated with the despairing mood of a world in rapid decay, it is also a manifesto for a new kind of crime novel, a bomb intended to blow up the vicarage whodunnit as decisively as the fifty tons of TNT that the eight-year-old Eric Ambler had watched devastate the Silvertown storage depot in 1917 in London's biggest-ever explosion. Written in 1939, with World War II imminent, it is really a story on at least two levels, possibly even a little allegorical. Charles Latimer, a successful murder mystery writer is shown the corpse of a villain in Istanbul. He spends the next three weeks investigating this corpse, travelling across Europe, and eventually becoming embroiled in committing a crime himself. Latimer is fascinated by how very different this reality is to his fictional world. On another level THE MASK OF DIMITRIOS is about the guises of evil. Dimitrios is an arch criminal, an assassin, white slaver, murderer, drug baron, and yet it is difficult to judge this on first meeting, to see the evil that lies beneath. It is a screen to hide his mind's nakedness. Only a few men, painters, have been able to see the mind through the face. Latimer meets a number of people who have been sucked into the vortex that surrounds Dimitrios. The evil is contagious. They in turn become evil and commit crimes and other horrendous acts. So there is a lot of social and political comment embedded in the novel, for those who want to see it. Ambler in a sense is using the novel as his vehicle for more than just a story. As Mazower pointed out, this is a relatively new path for crime fiction in 1939. I keep thinking of George Orwell's ANIMAL FARM not published till 1945 and, much more clearly to readers, also an allegory. Ambler's writer Latimer realises the real world is much more sordid, violent, and dangerous than any fictional one that he can create. But will it change his attitude to his work or indeed the nature of his novels? I felt Ambler's desire to make political points slowed the action down at times, and made me feel a bit ambivalent about whether I wanted to continue reading. There were times when I just felt that I wanted the plot to move faster, certainly in the first half. And yet there is no doubting the novel's power to make the reader think. From here on... a SPOILER. At the end it seems almost that Latimer has learnt nothing from the experience. He desperately wants to turn the clock back to a time when things were rosy. But he, Latimer, would not know about those things. He would be writing a detective story with a beginning, a middle and an end; a corpse, a piece of detection and a scaffold. He would be demonstrating that murder would out, that justice triumphed in the end and that the green bay tree flourished alone. He needed, and badly, a motive, a neat method of committing a murder and an entertaining crew of suspects. Yes, the suspects must certainly be entertaining. His last book had been a trifle heavy. He must inject a little more humour into this one. As for the motive, money was always, of course, the soundest basis. A pity that wills and life insurance were so outmoded. Supposing a man murdered an old lady so that his wife should have a private income. It might be worth thinking about. The scene? Well,there was always plenty of fun to be got out of an English country village, wasnt there? The time? Summer; with cricket matches on the village green, garden parties at the vicarage, the clink of teacups and the sweet smell of grass on a July evening. That was the sort of thing people liked to hear about. It was the sort of thing that he himself would like to hear about. Although I knew that THE HARLEQUIN TEA SET was a collection of 9 short stories published in 1997 in the US and Canada, I had not expected to find that I had read them all. All except The Harlequin Tea Set were published in While the Light Lasts which was also published in the UK in 1997. Claire Halliwell lives a quiet country life with her dogs. A conscientious and popular parish worker, she takes everything in her stride even when Sir Gerald Lee, the man she loves, marries Vivien a glamorous city girl. When Claire learns that Vivien is having an affair, her sense of duty to Gerald is stretched to the limit! (aka A Trap for the Unwary) Jake Levitt can’t believe his luck when one evening at the theatre he recognises the lead actress as Nancy Taylor, a girl he knows a lot about. A story of blackmail and murder ensue! In the excruciating heat of the African sun George Crozier is travelling with his new wife, Deidre. They have not been married long and George is aware his wife’s thoughts are with her first husband who was killed in this part of Africa during the war. In this hauntingly beautiful tale, Deidre is forced to confront the reality of her circumstances: “While the light lasts I shall remember, and in the darkness I shall not forget”. Frank Oliver returns to England from years of overseas service only to realise he no longer knows anyone there. On visiting the British Museum he encounters ‘the lonely god’ who seems to be experiencing the same sense of isolation that he is. Will this strange deity help relieve him of his loneliness? Two cousins, Fenella Mylecharane and Juan Faraker, are engaged. When their eccentric Uncle dies they eagerly return to the Isle of Man for the reading of the will. Having grown up hearing tales of buried treasure on the island they are excited when the Will reveals their Uncle had found it. But where? Alan Everard, a successful modernist painter, is married to the beautiful society girl Isobel Loring who eagerly promotes her husband’s work. At one of her tea parties, to which she invites the London art critics, she unveils her husband’s latest masterpiece, a portrait of herself but Alan realises the picture is lifeless. However a sketch he has done of his daughter's godmother, Jane Haworth, is full of life and honesty. Alan soon discovers that the real contribution Jane has made to their life is not just her artistic judgement. Bewitching Mrs. Clayton appeals to Poirot to help exonerate her lover Major Rich, indicted for her husband’s murder. Mr. Clayton’s body had been found in a chest, but who put it there? In this story Mr Satterthwaite is travelling to the house called Doverton Kingsbourne to see an old friend now in declining health. His car breaks down in the village of Kingsbourne Ducis and while his chauffeur and the garage mechanic fix it, he walks back to a tea shop that caught his eye as they drove into the village. He is sitting in the tea shop when another old friend Mr Harley Quin walks in. 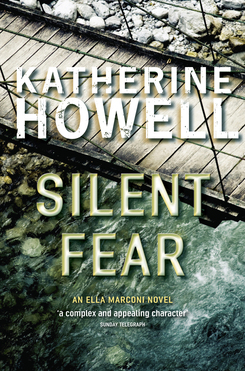 As in the other novels, there is also a thread that connects the paramedic Holly Garland and Detective Ella Marconi. In this case there is something in Holly's past that gives a colleague a hold over her, while a new detective is making Ella's life a little unpleasant. Howell strikes a nice balance between descriptive detail, and an authoritative view of both paramedic and police procedures. In the five novels in the series so far she has established an interesting character for Detective Ella Marconi, and yet it doesn't feel like the reader can't break into the series at any point. The result is a tightly constructed, fast paced thriller. A young girl's body was found washed up on the dramatic rocks beneath the Mull of Galloway lighthouse, but afrter twenty years her death is still a mystery. DI Marjory Fleming is called in to reopen the case her late father, a policeman, was unable to solve. I hadn't meant to leave it so long to read another in the Marjory Fleming series, nor did I mean to hop a book or two. I have already read the first two in the series, COLD IN THE EARTH and THE DARKNESS AND THE DEEP, but before I began this blog. I have included my mini reviews below. Set near Scotland's version of Land's End, it's most southern tip, the Mull of Galloway, the Marjory Fleming series are police procedurals usually firmly anchored in contemporary events. In this novel foreign workers are moving into the area, accepting lower wages, and causing resentment amongst local young men who feel that they are being robbed of their livelihood. A popular television series, itself a police procedural, is having an episode filmed in the neighbourhood as a tribute to an elderly star who is taking a cameo role, and Marjory's son Cam is off to France to play rugby. Detective Inspector Marjory Fleming has broken through the glass ceiling but life at the top is precarious, with her bosses hounding her and waiting for her to make a slip, and other women such as the Acting Procurator Fiscal undermining her at every opportunity. Marjory is also finding that the job really requires her full time attention and she has a husband who is a farmer, and two children in their late teens. As with the earlier two that I have read this is a very readable book. There are a couple of nice twists to the plot and the investigation of the cold case from twenty years earlier calls into question the balance in the allocation of resources to current cases versus cold. When it is just an assault under scrutiny it does seem that the cold case is very important, but when a murder occurs, the cold case need to be shelved, but for Marjory it just won't go away. If you like British police procedurals and are looking for a credible female protagonist, you'll enjoy this series. (I mentally compare her to Anne Cleeves' Vera Stanhope and Helene Tursten's Irene Huss). Starting from the beginning would be a good idea if you have time. #1 in Templeton's Marjory Fleming series: COLD IN THE EARTH is set in Galloway, Scotland, and foot and mouth disease strikes the cattle. All livestock have to be destroyed, including the sheep Marge's husband Bill loves so much. When a burial pit is dug at Kirkluce human remains are found. The Mason family on whose property the remains are found are so committed to raising cattle that they go to Pamplona every year for the running of the bulls, and Jake, the head of the family is nicknamed the Minotaur. An interesting snapshot too of a community torn apart by first of all the BSE and now the foot-and-mouth crisis. Herds and flocks built up over generations have to be destroyed. This is D. I. Marjorie Fleming's first murder investigation too. She is a tall raw-boned Scotswoman who rules her investigation team with sensitivity and purpose. The characterisation and humanity in these books is excellent and I will certainly be looking for #3 in the series ( LYING DEAD). The second in the series with protagonist D. I. Marjory Fleming. The wreck of the Knockhaven lifeboat causes the death of all 3 of its crew, and worse, it looks like it is the result of sabotage. D. I. Marjory Fleming is a tall raw-boned Scotswoman who rules her investigation team with sensitivity and purpose. This is an excellent read - many red herrings and lots of well drawn characters. Helena Radley, formerly Fielding, was found guilty of the murder of her husband Neville Fielding. Neville's problem was that he was finding it increasingly difficult to separate his own personality from that of his television one, 'Bad' Harry Bradman. When they bought the ugly Radley house in the equally ugly Fens village of Radnesfield, Neville was on the cusp of TV soap success. From that point on he became increasingly obnoxious. Neville's philandering led to his divorce from Helena and then her marriage to Edward Radley. And then Neville was killed. Helena is unable to provide any evidence of her innocence and is gaoled for 4 years. Shortly after she is released, young DS Frances Howarth, decides to set about proving Helena's innocence. One of Aline Templeton's early novels - interesting plot but a rather contrived construction, and a little unbelievable. For many of my contributions this year to Pattinase's Friday's Forgotten Books I am going to focus on the books I read 20 years ago in 1992. By then my reading diet was almost exclusively crime fiction. Having said that, Robin Cook's were at that stage medical suspense thrillers, so they had a touch of crime to them. I had already begun reading them prior to 1992, but I began the year with HARMFUL INTENT and then MUTATION. He sought to create the son of his dreams—and invented a nightmare. Robin Cook's new techno-medical thriller probes every father's greatest fear. Interested in more by Robin Cook? He's still writing and published DEATH BENEFIT, a novel about private health insurance and unchecked greed, in 2011. I haven't read any of his for some years now. I think I just grew away from them. With financial backing by Major Patrick Iko, the UN Ambassador from Talabwo, John Dortmunder puts together a team to steal the Balabamo Emerald from the exhibition at New York Coliseum. When the first attempt at the heist comes unstuck, and one of the team ends up in jail, so there are a succession of fresh attempts. Iko has agreed to pay each member of the team a daily retainer and a final amount. He also agrees to supply whatever guns etc Dortmunder requires. As the plot progresses, attempts to retrieve the emerald become more bizarre, the resulting equipment requests become even more bizarre. Dortmunder's determination to retrieve the emerald becomes stronger with each phase of the plot. For Dortmunder, the emerald becomes an albatross around his neck, his destiny. He must get it. To me it seemed that HOT ROCK had been written with an eye to a film script. There are passages that owe a lot to slapstick comedy, and yet at the same time the scenarios feel like serious attempts to resolve conundrums. How do you break into a prison? How do you raid a bank vault? 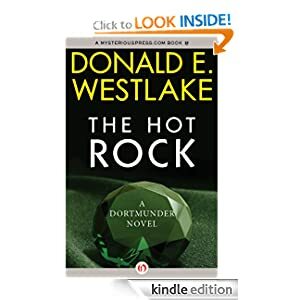 I read HOT ROCK because this week contributors to Pattinase's Friday's Forgotten Books are paying tribute to the work of Donald E.Westlake. It occurred to me that it was likely I had never read any of his books. Various participants suggested that I begin with THE HOT ROCK. I have enjoyed the book and may even read another at some time. You might like to read this article on The Thrilling Detective. Source: review copy kindly sent to Fair Dinkum Crime by the author. There may be troubles ahead...Northern Ireland. Spring 1981. Hunger strikes. Riots. Power cuts. A homophobic serial killer with a penchant for opera. And a young woman's suicide that may yet turn out to be murder. On the surface, the events are unconnected, but then things - and people - aren't always what they seem. Detective Sergeant Duffy is the man tasked with trying to get to the bottom of it all. It's no easy job - especially when it turns out that one of the victims was involved in the IRA, but last seen discussing business with someone from the UVF. Add to that the fact that as a Catholic policemen, it doesn't matter which side he's on, because nobody trusts him - and Sergeant Duffy really is in a no-win situation. Fast-paced, evocative and brutal, "The Cold, Cold Ground" is a brilliant depiction of Belfast at the height of the Troubles - and a cop treading a thin, thin line. 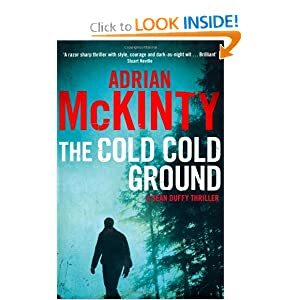 At the end of the book, in an "About" section, Adrian McKinty says the story "is a police procedural, but a procedural set in extremely unusual circumstances in a controversial police force cracking under extraordinary external and internal pressures..."
THE COLD COLD GROUND is set in Carrickfergus, Northern Ireland, where McKinty was born and grew up. At the time the novel was set, 1981, he was a teenager. He draws much from this background that was so close to him. The result is vivid description. The novel transports the readers to circumstances that are part of our recent world history, but that many of us are glad we didn't experience first hand. In fact it is difficult for those who have known only tranquillity to imagine what living in Belfast heartland must have been like.THE COLD COLD GROUND helps a little with that. This is a novel that makes you think. What is the relevance of a police force investigating a murder or a disappearance when so much death and destruction is happening everywhere as the result of terrorist activities? But then also, here are policeman who never know if they are going to come home after a day's work. Ignoring procedures such as checking under your car before starting out could well be fatal. I think Sergeant Sean Duffy is some one I would like to meet again. He emerges from his first outing a hero, although a very complex character, and not afraid to deliver his own form of justice. Through him comes a touch of McKinty's quirky black humour. I believe THE COLD COLD GROUND is to be the first in a trilogy, with the next called I HEAR THE SIRENS IN THE STREET. There is really no shortage of reviews of McKinty's work and this latest novel. McKinty has listed many of them in the sidebar of his blog. You can read a review of my latest novel, The Cold Cold Ground, in The Guardian, here. You can peruse the review from the Irish Independent, here or the review in The Times, here. The Glasgow Herald's verdict is here and The Sydney Morning Herald chips in, here. If you want to know what all the extraordinary fuss is about you can be a good chap and get The Cold Cold Ground on Amazon.com, Amazon.co.uk, Audible.com or at your local bookshop. Adrian McKinty is currently living in Melbourne. Check his blog here. You might also like to read this post. Amazon.com lists 11 titles by McKinty, although Fantastic Fiction lists 12. Background to the awards and past awards and nominations. The Barry Awards will be presented October 4, 2012 at the Rock & Roll Hall of Fame during the Opening Ceremonies of the 2012 Bouchercon in Cleveland, Ohio. I have read so few of these, it is not funny. What have you read? Where should I start? Any "must" reads? To say that I'm disappointed in the crime fiction offerings at this year's Adelaide Writers Week, March 3 -8, is an understatement. one Australian (Garry Disher), one American (Megan Abbott), one Norwegian (Jo Nesbo). My disappointment is no reflection on the quality of these writers, but on the paucity of sessions available to crime fiction readers, given the strength of the genre in Australia. With what I perceive as the incredible popularity of the genre, crime fiction readers have been properly put into their place. In the past we have seen a number of crime fiction sessions, including a good number of Australian writers. In addition, this year it appears that organisers have decided not to publish online a pdf copy of the programme. Rather they encourage the public to purchase a printed programme from their favourite newsagent for just $10. For me that would work out to approximately $1.50 for each (free) session that I am interests me. So, in case your interests coincide with mine, here are the sessions on offer. For full programmes of each of the days go here. My previous post on Adelaide Writers Week last year looked forward to AWW with great anticipation. A serial killer mystery laid in ancient Egypt 4000 years ago. Into the household of Imhotep, the Mortuary Priest, comes the beautiful Nofret. The household, outwardly at peace, has at its core, in the words of the thoughtful scribe Hori, a rottenness that breeds from within. With Nofret comes anger, jealousy, quarrels and finally death. Human passions were the same in 2000 BC as they are today. The fussy and pompous Imhotep, the timid Yahmose, the quarrelsome Sobek, and the malicious ‘poor relation’ Henet – all are types to be met with now in 2000 AD. Agatha Christie’s experiment is as ingenious and baffling as always, and ends with a climax which few will anticipate. I think I have rarely enjoyed a Christie title more than this one. But I don't remember ever reading it before and that may be the clue to why it felt so fresh. I don't remember whether Christie ever gave a historical setting like this to any other novel. She tells us in an "author's note" at the beginning where the plot and setting came from. The action of this book takes place on the West bank of the Nile at Thebes in Egypt about 2000 BC. Both place and time are incidental to the story. Any other place at any other time would have served as well: but it so happened that the inspiration of both characters and plot was derived from two or three Egyptian letters of the XI Dynasty, found about 20 years ago by the Egyptian Expedition of the Metropolitan Museum of Art, New York, in a rock tomb opposite Luxor, and translated by Professor (then Mr) Battiscombe Gunn in the Museum’s Bulletin. When Imhotep returns to his family in Thebes with his new concubine Nofret he unleashes forces for evil within the family that have lain dormant for years. You do not understand, Renisenb. There is an evil that comes from outside, that attacks so that all the world can see, but there is another kind of rottenness that breeds from within–that shows no outward sign. It grows slowly, day by day, till at last the whole fruit is rotten–eaten away by disease. When Imhotep leaves again for three months, leaving Norfret behind, the forces are unleashed and the murders begin. One after another, family members whom the reader suspects of the first murder are themselves attacked or killed, until there are so few left to suspect. And then Christie plays her trump card. 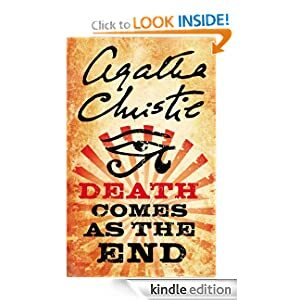 I saw a fellow blogger comment the other day about how this was the best Agatha Christie title she had ever read, and I can understand why. The plot and whodunnit aspects are engrossing. ROGER SHERINGHAM'S MOST FAMOUS CASE. In 1920s London, six members of the Crime Circle set out to solve a murder that has baffled Scotland Yard. Equipped with all of the facts, as told to them by Chief Inspector Moresby, club president Roger Sheringham and his armchair detectives pool their collective talents to formulate theories about the death of Mrs. Joan Bendix by nitrobenzene poisoning. Over six successive nights, each member puts forward a plausible theory, but will any of them be able to reveal the truth? THE POISONED CHOCOLATES CASE allows six detectives to take a case of death by poisoning and to place their own interpretation on the facts. As each presents his or her interpretation so the others, all except one, agree that this is the best interpretation and that the murderer has been uncovered. They use of a variety of methods, both deductive and inductive, placing new interpretations on existing evidence, and conducting active investigation that brings new evidence to light. The agreement is that they will eventually present the correct answer to Scotland Yard, and indeed the answer they will present to Chief Inspector Moresby will differ from what he thinks has happened. The novel floats the idea of a "detection club" similar to the one which Berkeley in fact brought into being the year after THE POISONED CHOCOLATES CASE was published. ROGER SHERINGHAM took a sip of the old brandy in front of him and leaned back in his chair at the head of the table. Through the haze of cigarette-smoke eager voices reached his ears from all directions, prattling joyfully upon this and that connected with murder, poisons and sudden death. For this was his own, his very own Crimes Circle, founded, organised, collected, and now run by himself alone; and when at the first meeting five months ago he had been unanimously elected its president, he had been as full of proud delight as on that never-to-be-forgotten day in the dim past when a cherub disguised as a publisher had accepted his first novel. It was the intention of the club to acquire eventually thirteen members, but so far only six had succeeded in passing their tests, and these were all present on the evening when this chronicle opens. There was a famous lawyer, a scarcely less famous woman dramatist, a brilliant novelist who ought to have been more famous than she was, the most intelligent (if not the most amiable) of living detective -story writers, Roger Sheringham himself and Mr. Ambrose Chitterwick, who was not famous at all, a mild little man of no particular appearance who had been even more surprised at being admitted to this company of personages than they had been at finding him amongst them. With the exception of Mr.Chitterwick. 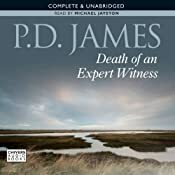 I found the novel a little dated but nevertheless interesting as the detectives basically used most of the common methods for deciding on who the murderer was. And as each of them did, so I nodded in agreement with each explanation, so persuasive were they. One of the characters remarks on how difficult it is to contradict a thesis when it is presented so persuasively. Born in 1893, Anthony Berkeley (Anthony Berkeley Cox) was a British crime writer and a leading member of the genre’s Golden Age. Educated at Sherborne School and University College London, Berkeley served in the British army during WWI before becoming a journalist. His first novel, The Layton Court Murders, was published anonymously in 1925. It introduced Roger Sheringham, the amateur detective who features in many of the author’s novels including the classic Poisoned Chocolates Case. In 1930, Berkeley founded the legendary Detection Club in London along with Agatha Christie, Freeman Wills Crofts and other established mystery writers. It was in 1938, under the pseudonym Francis Iles (which Berkeley also used for novels) that he took up work as a book reviewer for John O’London’s Weekly and The Daily Telegraph. He later wrote for The Sunday Times in the mid 1940s, and then for The Guardian from the mid 1950s until 1970. A key figure in the development of crime fiction, he died in 1971. For more see Martin Edwards' website. Charles Dickens - crime fiction writer? From time to time some of us wonder why we have a preference for reading crime fiction and we look to childhood authors such as Enid Blyton. In part my addiction can be laid at the door of Edgar Allen Poe whose short stories I read in my teens. But in the South Australian secondary education system in the 1960s we read a lot of Charles Dickens and to him I attribute my ability to see a mystery in almost every novel. Although he didn't set out to write crime fiction, there is always at least one puzzle to be solved in a Dickens novel and the crime and justice system often comes in for castigation. Dickens' plots were often complex, full of clues and red herrings, couched in words that you had to read carefully. Through his eyes we see the effects of industrialisation on British society, a justice system that couldn't cope, a growing class of the impoverished and disadvantaged who turned to crime, sometimes petty sometimes more extreme. Today, 7 February 2012, Charles Dickens (1812 - 1870) would have been 200 years old. a detailed biography on Wikipedia. 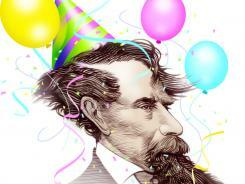 Dickens 2012: a website celebrating the activities of the Dickens bi-centenary worldwide. a 3 day seminar in Berlin at the end of January considered "what would Dickens write today?" Do you think he would have written crime fiction? Who would you liken him to? Has he had much influence on your reading choices? Take a Dickens Quiz - I got 8! BEFORE I GO TO SLEEP is an ambitious debut novel: a story told from the point of view of an amnesiac whose memory, both short term and most of her long term, disappears overnight and dumps her back into life each morning over two decades earlier. Even then her memory of life until then is patchy and imperfect. You get the general gist of the novel from the synopsis (above). There is a mystery on several fronts: why over twenty years have elapsed since the "accident" happened that left Christine like this; whether the two main people in her life, her husband and the neurologist, are actually telling her the truth; whether the fact that Christine was a writer had anything to do with her accident. Christine, at the prompting of her neurologist, resorts to a ploy that Mike Befeler's elderly protagonist Paul Jacobsen also uses in the geezer lit cozy RETIREMENT HOMES ARE MURDER (published 2007), keeping a journal on a daily basis. The journal becomes his memory. In Christine's case she records what she is told as well as what happens to her. So this "memory" is imperfect as well. There was enough in BEFORE I GO TO SLEEP to keep me going, sufficient curiosity about what had happened to Christine, whether she would have a miraculous recovery that would put everything in its place. I think Watson probably took the theme as far as he could. There was the impression that the author was exploring some laneways to see where they led, only to back out of them when they became unproductive. As Christine pieces together her story via her journal, so too the reader, on another level, puts together the timeline of what has happened to Christine in the last twenty-plus years. Therein lies the mystery element. There are a number of story elements that remain unexplained and of course the reader at times knows quite a bit more than Christine does even though she diligently reads through her ever expanding journal when reminded to. BEFORE I GO TO SLEEP won the 2011 CWA John Creasey (New Blood) Dagger and the Galaxy Book Award for 2011 Crime & Thriller Novel of the Year as well as coming to the attention of Richard & Judy. It is 1826, and in the town of Redditch in Worcestershire, Thomas Potts, reluctant Parish Constable, battles single-handedly to keep the peace and control crime. With the notorious "Needle Pointers" up in arms at the news of a cut in their rate of pay, and a mysterious criminal gang, known as the "Rippling Boys", robbing, murdering and body-snatching with impunity, gentle, timid Tom has his work cut out. At the same time he deals with the daily, unreasonable demands of his shrewish, bedridden mother and seeks out every possible opportunity for courting the pretty Amy Danks. Peter Wickham does a wonderful job of the narration of this book and I particularly liked the shrewish voice of Tom's mother. Several historical issues are raised in this novel: the extent of grave robbing and the selling of "fresh" corpses to hospitals and the like; the hazards of needle making for the woollen mills, a topic I had never given much thought to; the fact that parish constables like Tom Potts were under the control of the Parish council, were poorly paid, and thinly stretched; the lack of procedures that we now take for granted in detection of crimes. I guess the latter is pretty obvious when you think about it, but Tom is dabbling in finger printing and teaching himself to perfect the technique and to recognise individual palm and finger prints. According to Wikipedia a Czech physiologist and professor of anatomy at the University of Breslau, published a thesis in 1823 discussing 9 fingerprint patterns, but he did not mention any possibility of using fingerprints to identify people. Tom finds finger and palm prints fascinating and successfully uses them to identify suspects. Similarly he makes sketches and measurements of foot prints for later comparisons. As my listening partner remarked, we are already familiar with some of this historical background, but placing it against a crime fiction story just makes it seem more real somehow. 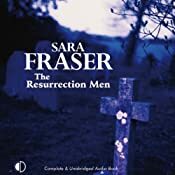 THE RESURRECTION MEN is not for delicate sensibilities - there is a lot of crude language at the beginning, which probably seems stronger because it is actually being read to you. The book is #2 in Fraser's Thomas Potts series, of which there are now 4 titles. The author appears to be determined to give readers a historically authentic experience. 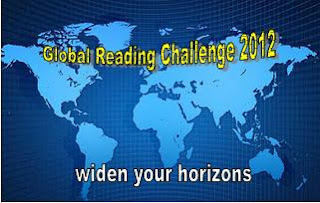 This post is a reminder for those who have been vacillating about joining GRC2012, or maybe you have never heard of it and are looking for something that will help you extend your reading..
As in the past, the Global Reading Challenge (GRC) challenges you to expand your reading boundaries, go where you haven't been before, move a little outside your comfort zone. Your reading will take place in the calendar year 2012. You may like to consult Global Reading Challenges for 2011 and 2010 for suggestions of books. Use the Mr Linky to sign up with your name, the level you intend to attempt, and your blog URL. Feel free to include the logo in your blog posts or on your blog. My final post for GRC 2010 shows you what it can look like. Africa, Asia, Australasia/Oceania, Europe, North America, South America (please include Central America where it is most convenient for you), The Seventh Continent (here you can either choose Antarctica or your own ´seventh´ setting, eg the sea, the space, a supernatural/paranormal world, history, the future – you name it). I've decided that I like the sort of crime fiction that makes you think. I don't mean just to solve the central puzzle, but also to think about contemporary issues. Earlier this week fellow blogger Margot Kinberg was talking about how crime fiction has changed, and one point she made struck me in particular. There might be more than one murder or crime, but all were related to the central mystery. Christie’s standalones tend to be that way, too (although there are exceptions). We also see that focus on one murder or set of murders in Arthur Conan Doyle’s Sherlock Holmes mysteries. Those stories too, including the novels, are focused on one case, even when there is more than one murder or crime. In most of the books I have been reading recently there seems to be a primary investigation which is pursued throughout the story, but in the ones that I've liked best, there are other things to think about too. Nearly everyone in Australia is familiar with Schoolies Week and probably has the attitude of "thank goodness it doesn't happen in my town/suburb". Against the issues of Schoolies Week, we have other issues such as whether people who work together should live together; what causes young people to commit suicide; and control freaks who stalk their spouses. Four bodies are found in a coal cellar and that of course is the primary investigation. But against that thread is the issue of retirement where Reg Wexford is desperately trying to strike a balance and come to terms with the fact that he no longer works. The primary investigation is into the death of a popular Tasmanian police sergeant in the course of his duties, but a range of side issues come up: an Aboriginal population, the remnants of Australia's original inhabitants, now welfare dependent, and in some cases only too willing to cry victimisation and brutality; an under resourced police force with more than usual difficulties in recruiting and retaining good officers; corruption in all professions, even among those responsible for managing the legal system; and an island state with significant social prejudices. So maybe the fact that I am now looking for side issues in a murder mystery novel explains why last year I found some of the Vintage crime fiction that I read just a bit flat. I think you can see that when you look at how I rated them. As I said last week, when I featured Ngaio Marsh's COLOUR SCHEME, for my contribution this year to Pattinase's Friday's Forgotten Books I am going to focus on the books I read 20 years ago in 1992. By then my reading diet was almost exclusively crime fiction. In January and February of 1992 I went through a Ruth Rendell phase. My records show that I read 12 Ruth Rendell titles, in no particular order really, starting with ONE ACROSS, TWO DOWN, a standalone published in 1971. Of course, now, 20 years on, I don't remember much about the book at all. Two things interest Stanley Manning: crossword puzzles, and the substantial sum his wife Vera stands to inherit when his mother-in-law dies. 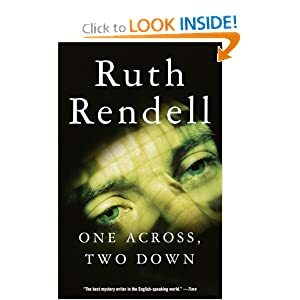 In One Across, Two Down, master crime writer Ruth Rendell describes a man whose strained sanity and stained reputation transform him from a witless loser into a killer afraid of his own shadow. According to my records though, this marks my "discovery" of Rendell, and I have been a fan of her writing ever since.